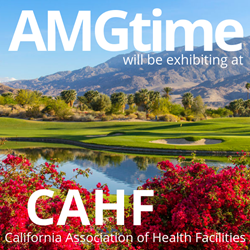 AMGtime will be presenting time, labor management, and scheduling solutions at the 68th annual CAHF Convention and Expo in Palm Springs, California from November 12-13. As a CAHF member, AMGtime understands and solves for labor management needs of the healthcare industry. AMGtime will be returning to the 68th Annual CAHF Convention and Expo held in Palm Springs Convention Center. From November 12-13 AMGtime will take over booth #613 to showcase time, labor management, and scheduling solutions. Our products and services include cloud and PC based software, biometric devices, mobile apps, specialized industry solutions for industries including healthcare, and more. As a CAHF member, AMGtime understands and solves for labor management needs of the healthcare industry. Solutions like Workforce Scheduling, Job/Department Costing, and more have been developed to address the wants of various facilities. Workforce Scheduling is the newest labor management tool. Capabilities include options to auto-schedule according to set preferences, allow employers to assign skills, training and/or certification for individual jobs, and allow employees to swamp, drop or pickup shifts, just to name a few. Job/department costing allows management to apply different wages for employees that may have different jobs within a shift. AMGtime has also developed a solution for skilled nursing facilities specifically. The Skilled Nursing Facility module was developed to automatically monitor nursing hours per patient day in real time and generate various reports including a XML output formatted for PBJ specifications. Due to recent law changes in California, AMGtime has updated the module to include Certified Nursing Assistant (CNA) hours within NHPPD. Mobile apps and biometric hardware also pair nicely with the aforementioned solutions. Mobile apps are ideal for on-the-go workers that may need to travel to homes or other facilities. Biometric hardware provides a quick and seamless way for employees to clock in. There’s a variety of data capture options available ranging from fingerprint to proximity cards. Sterile environments tend to prefer our facial recognition system, however. The CAHF Convention and Expo guarantees an enjoyable experience for everyone with education sessions, networking opportunities, fun activities, live entertainment, and insightful takeaways from keynote speakers. Attendees will have access to over 240 booths with business solutions that can address their need to save time and money. A variety of activities are offered at CAHF including the annual flamingo bingo, treasure hunt, pop-up margarita bar, photo-booth, oxygen bar, health-screenings, and many more. AMGtime will be a flamingo booth participant. Stop by AMGtime at booth 613 to collect your sticker for the flamingo bingo, also enter for a chance to win a $100 Amazon Gift Card. AMGtime is a national leader of time, labor management and scheduling solutions used for workforce management. In addition to customizable and scalable software on both cloud and PC, AMGtime offers a variety of biometric devices and mobile applications. AMGtime provides customizable industry solutions for healthcare, staffing, and more. Recognized as a preferred partner in the Skilled Nursing industry, AMGtime offers a module that monitors nursing hours, provides PBJ exports, as well as other reports. With an open API, AMGtime can be bridged with payroll, HR, and other external software solutions. AMGtime’s offerings are customizable and adaptable for basic to complex configurations, and simple to implement, providing organizations with the highest level of efficiency and ROI. For more information visit http://www.amgtime.com.